This is the second part of our 'Welcome to Jurassic China' series, which takes That's readers on a journey to explore prehistoric China and to meet the people who earn their keep studying, stealing and recreating the nation's long-extinct dinos. Click here to read about China’s ‘Pinocchio rex’ and here to read our interview with Zhao Chuang, a world-renowned dinosaur artist. As far back as 1930, China has had something in legal writing aimed at preserving relics and cultural objects, but the definition of what constitutes a ‘relic’ was up for interpretation. The 1930 Law on the Preservation of Ancient Objects dictated that the state controls any unexcavated relics within the country’s borders and that any unauthorized digging for fossils was considered an act of theft. The laws concerning artifacts continued to be better defined throughout the years, with the 1982 Cultural Relics Protection Law and subsequent revisions in 1991, 2002 and 2007. Clear-cut fossil protection regulations, however, weren’t enacted until 2011. A more comprehensive list of fossil material, as well as ‘any other specimens deemed as important,’ are now protected by the state. Prior to this, according to a research paper titled Out of China: Dinosaur Eggs and the Law on ‘Kong Long Dan’ by Jeff Liston, thousands of dinosaur eggs and fossils were removed from China, ending up in the hands of private collectors, museum curators and auction houses. This exodus of prehistoric artifacts was the result of the poorly defined earlier legislation as well as corruption and bribery. The agriculture sector was responsible for most of the excavation and sale of dinosaur-related materials in China at the time. Those involved were (and often still are) regularly on the frontlines of paleontological and archeological discoveries, and they quickly realized the demand for such relics in other parts of the world, especially the West. In rural parts of China, this led to the country’s very own ‘fossil rush,’ befittingly the successor of the 19th-century ‘Great Dinosaur Rush’ in western territories of the United States. Dinosaur discoveries during that period helped garner interest from wealthy Americans, which resulted in expeditions to China and Mongolia. One notable explorer, Roy Chapman Andrews (rumored to be the inspiration for the character Indiana Jones), organized a series of trips to the Middle Kingdom called the Central Asiatic Expeditions in the 1930s, with the backing of New York financiers John Pierpont Morgan and John D. Rockefeller, as well as the American Museum of Natural History. Andrews made many groundbreaking discoveries in Mongolia (most notably the Flaming Cliffs), excavating dinosaur eggs and bringing them back to the US. Although Andrews told the Chinese government, which ruled Mongolia at the time, that the dinosaur eggs did not hold any monetary value, the explorer ended up auctioning off the fossils in New York City to fund future expeditions. Needless to say, China was not impressed. As a result, Andrews delayed his next expedition for more than a year as he worked to assuage the tension with Chinese officials. Since Andrews’ discovery and subsequent sale of dinosaur eggs, people from all around the world have been combing through China’s vast terrain to uncover anything deemed valuable. While the excitement of unearthing fossils that may reveal new dinosaur species was a motivator for some, many Chinese farmers who worked the land under which countless fossils lay were only after financial reward. This led to many fossils being removed from the country and sold abroad in auctions. But are such fossil sales legal? It turns out this merely depends on where a given fossil was discovered. In China, specially protected prehistoric relics belong to the state and cannot be sold to foreigners or foreign organizations. In the United States, however, property owners have the right to sell items and resources found on their property. Auctions held in recent years have showcased prized dinosaur fossils of well-known species as well as potentially new species that haven’t been properly examined by researchers. 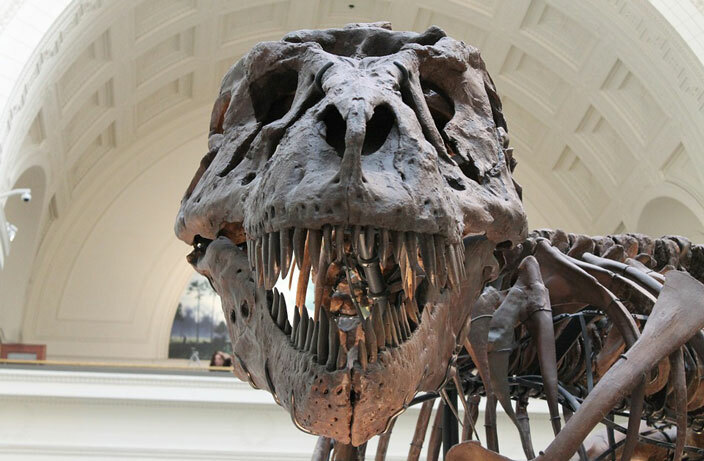 Perhaps the most notable of all dinosaur fossils found in the US, nicknamed ‘Sue the Tyrannosaurus rex,’ was auctioned off for USD8.36 million to the Field Museum of Natural History in 1997. Back in Asia, an auction was held in Hong Kong in 2015 with one big-ticket item: a fossilized Triceratops skull discovered on private property in Montana, US. The price tag? Undisclosed. But with a minimum bid of USD1.8 million, the new owner likely paid an arm and a leg for the priceless relic from the Cretaceous Period. According to Jing Daily, the possibility of the skull being purchased by someone from Hong Kong or the Chinese mainland was “highly likely,” as there is an increasing number of collectors participating in such auctions throughout the Greater China region. Even though many fossil auctions are legal, paleontologists and researchers argue that the private sale of rare fossils hinders scientific research since experts often have limited to no access to the specimens. While some collectors will loan their prized possessions to museums and other institutions, it is entirely up to their discretion. Not all fossil sales are legal, though. In 2012, a Floridian named Eric Prokopi pled guilty to smuggling the fossilized remains of a Tyrannosaurus bataar (or Tarbosaurus) skeleton out of Mongolia. Prokopi, a self-proclaimed ‘commercial paleontologist,’ has been painted as both a passionate dinosaur enthusiast and a smuggler. In 2010, Prokopi began a roundabout process of importing the Tarbosaurus into the US, first transporting the specimen to the UK to avoid being detected in customs. After restoring the dinosaur remains (a skill he had honed for well over a decade), the skeleton was sold in New York for over USD1 million in 2012. This US court ruling set a precedent not only for prehistoric fossils imported into the US but also for the government’s role in cracking down on black market smuggling. In 2015, a Canadian man named Jun Yang was arrested at a gem and mineral trade show in Arizona for trying to sell a fossilized Psittacosaurus and a number of Hadrosaurus eggs. At the time of his arrest, he told authorities that the fossils were somewhere between 100 and 130 million years old and were illegally exported from China. That same year, actor Nicolas Cage agreed to hand over a rare dinosaur skull that also turned out to be stolen from Mongolia. According to The Guardian, Cage had reportedly outbid movie star Leonardo DiCaprio for the hot item, which cost Cage USD276,000. (It’s important to note that Cage was not accused of any wrongdoing, especially after receiving a certificate of authenticity from the I.M. Chait Gallery, the auction house that sold him the item). With persistent calls from the science community for private collectors to be more forthcoming with fossils in their possession, particularly specimens that have yet to be correctly identified, some collectors have complied. A French citizen who legally purchased an unknown dinosaur skeleton in Paris in 2018 for roughly USD2.3 million, told the auction house that they would present the specimen to the public. The dinosaur remains, which were discovered in the US state of Wyoming, were said to be 150 million years old. While it’s hard to pinpoint which direction the fossil trade is heading, one thing that is certain is that smuggling fossils won’t be getting any easier. Whether the tightened regulations will deter more people from excavating and exporting fossils is tough to say, but with authorities around the world monitoring the industry more closely, stolen prehistoric relics will hopefully find their way home. Click here to read more from our ‘Welcome to Jurassic China’ series. The hope is that rewarding tips will help to combat the intrusion of religion into China and control religious interactions. China’s CSI 300 Index, which gathers the top 300 stocks on the Shanghai and Shenzhen stock markets was down by 4.64% at 3pm. In a move to further open up its stock markets, the countries top security regulator approved a regulation in which foreign individual investors can have onshore security accounts. A recent report shed light on local gangs' practice of laundering drug money through casinos and Canadian real estate. British Columbia Premier John Horgan recently concluded his inaugural trip to Asia, which included a stop in Guangzhou.